I really enjoyed this discussion. I knew I wanted to go to this when I saw that it was Scott Hanselman (great podcaster and now a Microsoft employee), Phil Haack (of SubText and now Microsoft), Rob Conery (of SubSonic and now Microsoft developing Subsonic full time), and Shaun Walker (of DotNetNuke). I love how panel discussions take on a life of their own, depending on the audience. This was definitely like that because we had some interesting people in the audience. Among the crowd, the first person in the audience to want to ask questions was Charlie Poole (of NUnit). He was animated! He was wildly waving his hand back and forth until someone gave him a microphone. I took a picture, but it was not a very good one though. He was talking about how Microsoft hasn't always supported OSS projects. He also spoke of being disinvited from conferences in the past. 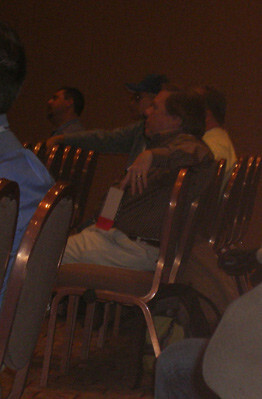 There was also Jay Flowers (of CIFactory) hanging out in the audience. Troy went to the session he did on CIFactory and says that it is definitely worth checking out. I was definitely surprised by the number of hands that went up when it was asked how many people contribute to an open source project. Of course that session was in the Open Force Conference Side, so it is really not that surprising to see that number of people in the conference are contributors to open source. It makes me want to contribute to an Open Source Project. I am definitely taking the recommendation from Phil about a book to read. Mostly the discussion was towards licensing. Licensing is apparently one of the most important choices you will make in an open source project. Another one is where to host your project. So the discussion was good, although we were with a group of MS employees that have a total of 8 weeks with a blue badge. They all contribute to Open Source Projects themselves and that is where they are coming from. The feeling coming out was that there is much better support for OSS and Microsoft. That is where we see a lot of stuff getting out to CodePlex that MS employees are posting. I think it will be great if the feeling is still there when they are more seasoned employees (although I think they will continue it because Scott Guthrie has the same attitude). The Gu <raises hands and bows down> unfortunately was not able to make the discussion as he had to get back to Redmond the night before.